Jack Murphy has been busy in his first few weeks as head coach of Northern Arizona. Slowly word has been coming in about the new additions to the roster, and NAU's official website has details on five new players for Northern Arizona. Northern Arizona will have three scholarship signees, one walk-on, and one transfer, it has been announced. Forward Jordyn Martin of Palo Verde High School in Las Vegas, forward Blake Hamilton of Pasadena (Calif.) High School and guard DeWayne Russell of Peoria (Ariz.) High School have signed National Letters-of-Intent to attend NAU this fall. Murphy also got commitments from former Tempe McClintock standout forward Cameron Forte, a transfer from Texas Tech University, and Sunnyslope guard Bryce Gosar. We have talked a bit about Jordyn Martin, who is the big man of the class at 6'7'', and who should have a chance to step in from day one with NAU's lack of size. He averaged nine rebounds per game last season. Blake Hamilton is 6'5'', but he may be called upon to play in the frontcourt a bit as well, if his high school numbers are any indication. He averaged 16 PPG, 11 RPG, and 4 BPG last season. His cousin (Jordan Hamilton) is in the NBA, and his father played college basketball as well, so obviously he comes from a very strong athletic background. Murphy said he called him on his first day as NAU head coach, and he could be a nice player for the Lumberjacks as early as next season. 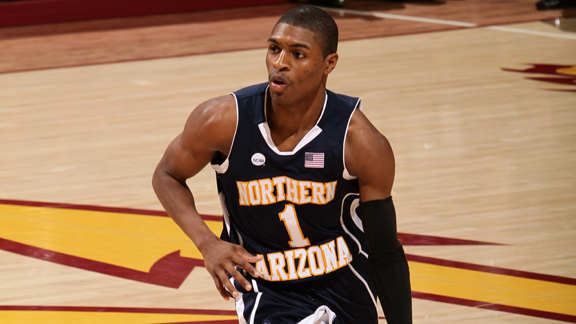 DeWayne Russell is a 5'10'' that led the state of Arizona in scoring last season at 27 PPG. He also averaged over five assists per game, as well as almost four rebounds and four steals per contest. He originally committed to USC in January, but decommitted after the season (rumors are that he may have had academic issues, or USC may have lost some interest). He had a few other Division I offers after leaving USC, and it appears that he could step in and get immediate minutes. Cameron Forte led the state of Arizona in scoring two seasons ago, when he averaged a robust 36 points per game. He spent last season at Texas Tech, but will transfer to NAU. He also averaged 12.7 PPG, and stands at 6'6''. He should have all four years of eligibility remaining, if I am understanding it all correctly. He could be a big coup for the Lumberjacks, as he has the potential to be an elite scorer in the Big Sky. The last signee is Bryce Gosar, who was invited to walk-on at Northern Arizona. He stands at 6'1'', and averaged 21.6 PPG last season. Both of his parents played for Northern Arizona, which officially helped in convincing him to come aboard even if they don't have a scholarship for him at this time. He could contribute early as well. For many Big Sky teams, they sometimes have to take on a few junior college guys to fill out their roster, especially late in the spring. That Murphy was able to get four freshmen and a DI transfer in such a short period of time is extremely impressive. The future that seemed a bit bleak a few weeks ago suddenly looks a lot more rosy. Not everything is rosy though. We already talked about Colin Gruber transferring, and it seems that James Douglas will leave also (his name is no longer on the roster). He was one of the best freshmen in the Big Sky last year after leading the Lumberjacks in scoring with 11.8 PPG. He had the potential to be a really dynamic offensive player, especially as NAU got more talent and he was not asked to do as much. It will be interesting to see where he goes. Look for this to be made public in the next few days, Sophomore Guard Danny Cheek will also transfer and leave NAU (most likely to a JC as well)... Stallon Saldivar is also looking to transfer, and Josh Lepley is no longer with the team.. Lots of chaos in Flagstaff once again. Crazy... seems like Lepley just got back on the team!! Cheek I could see... he hardly played last year after being fairly highly touted, so I am not surprised that he would leave. Saldivar is a bit odd, since he will be a senior... wouldn't have expected to see him leave. Thanks for the information and please let me know if you hear any more! Losing your backcourt for players who weren't heavily recruited isnt' the right direction. Regardless, it is good seeing Murphy getting some talent. However, the same problem still exists, very limited frontcourt. How can a DI transfer have four years? If he Red Shirted last year at Texas Tech he would still have to sit out a year. Is there an explanation? Just curious. There are loopholes. After everything that has gone on over the past few months with NAU, I think it was a given that some guys would be leaving no matter who the head coach was. The fact that he has been able to replenish the roster with at least scholarship guys is positive. For the DI transfer and 4 years... if I am not mistaken, a transfer year that you sit-out does not necessarily count as a redshirt year. That is my undertstanding at least. I may be incorrect on that. That is too bad MT... I was looking forward especially to watching Cheek. Thought with a new start and good system, he could have been a real good player for NAU over his career. The most important thing for Murphy was to keep the best that remained and then to sign some kids who can immediately play. I think Murphy is aware that the next few years will be tough. It doesn't mean he isn't a good coach, just that there wasn't a lot to work with when he arrived. He will do fine though. As long as he makes steady improvements, the Lumberjack faithful should stay happy. Tab Boyle was put in a similar position at UNCO and look what he left. Granted, it looks messy now, and hearing about the loses of three solid players doesn't make things any better, but he still has the core of the team in Flagstaff (Salvidar and Rogers)that in and of itself is a good thing. Will NAU win the Sky next year, in all likelihood no, but will they be headed towards being competitive...yes. Will it take time? Yes, two or three building years, but the Jacks will be back.